Words by Kevin Doocey on August 19, 2009 . 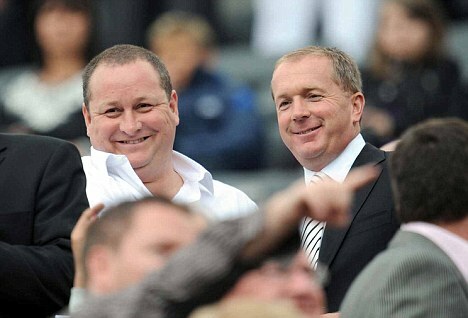 The future of Newcastle United lies with a bank called Barclays, the sponsors of the Premier League. Today (Wednesday), Barry Moat was expected to hear back on whether he’s request was successful. If he is not which there is a good chance in happening, then Newcastle will remain in the hands of Mike Ashley until January at the very least, however, we’re hopeful that Moat does indeed get his loan from Barry Moat. And to make things even more complicated a new consortium have entered the race, led by Graham Roberts former Tottenham defender. First of all we don’t need this ‘Fans 401’ group and secondly their finances will be very very questionable. They say that they’ll clear the debt as well pay the full £100m for the club. However, everyone’s just a little skeptical. The last thing we need now is another hold up as we’ve had enough of them. We’ve had deadlines set every other week and hopes raised or nothing, literally. Then we’ve had Malaysians who were close to buying the club, Asian’s who were buying Newcastle and didn’t know about it and an Iranian, with most people doubting his existence. It’s sums up Newcastle’s last two years and now here we are, in the Championship, and we haven’t improved behind the scenes one bit, that is why we are hoping a lifelong fan, Barry Moat, gets backing from Barclays and completes the long awaited takeover of our beloved club. Happy Birthday! Yeah we hope Moat takes over and that we can play something like we did the last time Sheffield Wednesday came to St.James' I'd easily take half that and settle for a 4-0 win. Will be tough enough, hopefully we'll get all 3 points. Just been reading there's to be an anouncement on Friday and it looks like Shearer/Carver &amp; not Shearer/Dowie any ideas Doocey? Been away all day Steve , only back now. Where's this coming from? Ah right, thanks. Yeah, another good win. Anyone got highlights for that game? It wasn't live anywhere besides the Gallowgate End! Yeah, there was a highlight on Sky Sports but I missed it. Was meant to be a good goals from Shola.